Right-click a blank area of the desktop and select “New” > “Shortcut“. Provide the name for the shortcut. You will probably want to use the name of the website in most cases. Now you have a shortcut that will open the website in a specific web browser, no matter what the default browser is set to in Windows. I have tested this thoroughly and it works in Windows 7 as well as Windows 10. To open in chrome as it’s own window, you should use the “Create shortcut” option under the More Tools menu in Chrome. 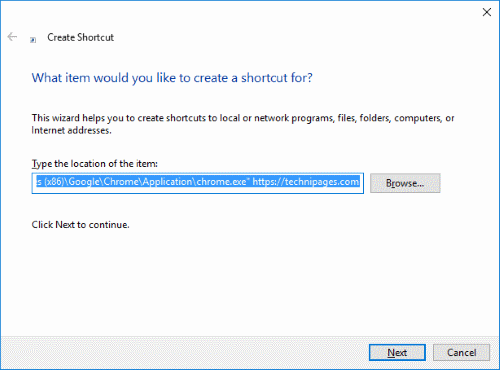 Check the “Open in Window” checkbox and the shortcut will receive a dedicated window. This definitely works. What I would like to have it also do is to open that link in its own browser window and not another chrome tab. Is that possible? For anyone getting the “The file C:\ “C:\Program cannot be found.” error, you need to put quotes on the URL also. At first, it gave the same error that Greg and David reported, but then I just Browsed (the long way) to the .exe for the browser I need and added the required URL afterward. Another option is to pin the page link to the browser icon on your task bar. Right click on the browser icon. Click the Pin on the right side of a recently viewed page. I don’t think it’s possible to set a specific browser for Outlook links. Chrome would have to be set as the default, then you could set every other icon to open to a specific browser. This didn’t work how I had hoped. It creates a desktop shortcut to the website only. I am looking for a different solution. At work we have three browsers: IE, Chrome, Firefox. IE is set as default becasue many of the web tools we use only work properly in IE. However, the version of WebEx we use only works properly in Chrome. I want to be able to set something so that when I click a link in Outlook that contains a webex.com link it opens in Chrome. Be sure to use quotation marks as I have specified before the C: and after the name of the browser executable. My computer is a Vista x32 – and I got this method to work with SeaMonkey and Pale Moon! I’ve been trying, for years, to figure out how to do this. Thanks Again – You’re the Best! Great tip! This fixes the problem of Google Earth not being supported in my main browser Firefox Quantum. Definitely helped Mitch, thank you ! In my case I use mostly Firefox for work reasons, so having a shortcut to files in Google drive (also for reasons) is tremendously helpful. Any tips on opening two tabs with one shortcut? Sweet! Worked for me. Thanks! Now I can avoid opening IE to start up another program. IE flashes up in the background momentarily, then goes away, and the other app fires up. Yay! I’m glad it worked for you. Thank you!! Trying to have a login page open in Chrome (default browser is Explorer). Tried using other methods and kept getting “Illegal Institution” error message. This method worked!